It was our dearest friend, Waluigi. After being absent from their roster list, he made a brief appearance during their demonstration of assist trophies. 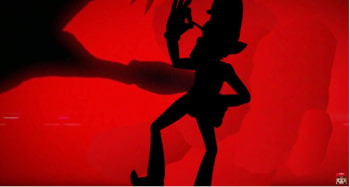 In a stunning moment of Nintendo’s own hubris, Waluigi was Murdered Live at E3! That’s right, folks. 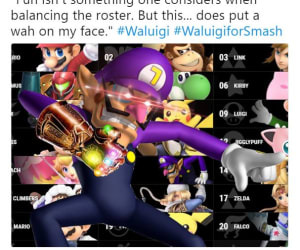 Since Waluigi is shown as an assist trophy, this means that our hero in purple will not be on the roster of playable characters in the upcoming Smash game. Needless to say, fans were stunned, and none were amused. Nintendo has, essentially, betrayed their fans’ trust by rendering their most well-developed and sexually attractive character unplayable in the upcoming Smash Bros. game. This is nothing short of a national tragedy, making the Boston Marathon seem like a scraped knee in comparison. Why, Nintendo!? This is, however, demonstrably false: he made no such statement of fans’ sincerity during his Nintendo Treehouse segment. So stop spreading false information, everybody. So, if Sakurai doesn’t actually hate Waluigi, why was he left to die? Well, maybe he wasn't. Some fans choose to remain optimistic and insist that his death was just a farce. Gaming YouTuber Alpharad uploaded a video, Waluigi in Smash Bros. Ultimate, where he presents a theory that it’s all a bamboozle on Sakurai’s part. 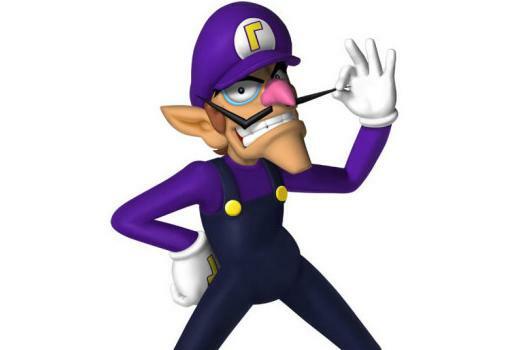 This is supported by the fact that while Waluigi was featured as an assist trophy during the E3 demonstration, he reportedly has not yet been present as an assist during demo play. However, none of this is confirmed in any capacity. At the moment, all we know is what we’ve seen so far: that Waluigi is only present as an assist trophy but absent on the roster, confirming that he will not be a playable character. Don’t get your hopes up, folks. 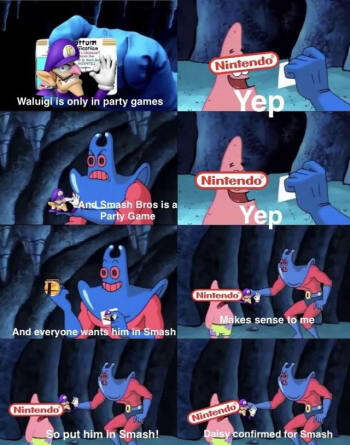 Waluigi is dead, and it’s all Sakurai’s fault. Goodnight, sweet prince. May fleets of angels sing thee to thy rest. We loved you, Waluigi. You’ll be missed.